The Alte Hof (Old Courthouse) in the center of Munich is the former residence of Emperor Ludwig IV (of Bavaria, 1282-1347). It was destroyed in the Second World War and was rebuilt around 1950. Manufactum, the department store extraordinaire, has been in this building since 2007, encompassing almost 900 square meters and housing their entire range of goods. 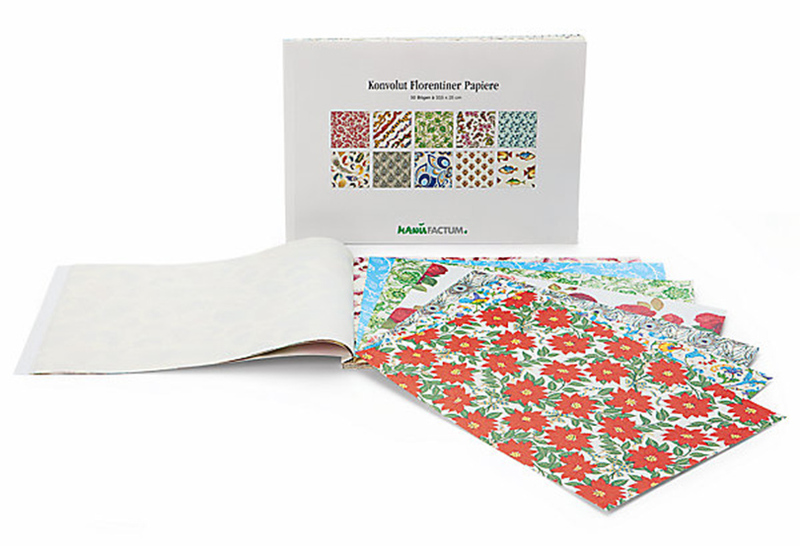 Manufactum is an upscale German retailer whose main focus is on household and garden goods all made with traditional manufacturing methods and materials (thus, “Manufactum”). In addition, the company carries top quality apparel and shoes, papers, computers, cosmetics, bikes, foodstuffs, books and furniture. With 9 stores in total, these perfectly edited emporiums have row upon row of leather goods, kitchen supplies, textiles, and more. Almost everything is unique in its design, and according to a Trip Advisor reviewer, “good luck finding similar items elsewhere. You can go in needing nothing and wind up staying for hours.” The stores smell of wood and leather, the materials which compromise much of their inventory: purses, work gloves, small toys, and furniture. From coffee grinders to hiking boots, wool sweaters to soap dishes, leather journals to garden trowels, shaving brushes to fine chocolate and marmalade, the selection is incredible with truly unique products abound. Manufactum was originally founded in 1988 by Thomas Hoof, former managing director of the German Green Party in North Rhine, Westphalia. In 2007, the Otto group (think Spiegel catalogue, or Eddie Bauer) took over. In Germany, Manufactum catalogs have been enjoying almost cult-like status among a certain clientele. Stores are currently located in Hamburg, Berlin, Waltrop, Düsseldorf, Cologne, Frankfurt, Stuttgart, Munich, and Bremen. They have several of their own brands of food items sold in their own stores and a line of products made in monasteries. “Anyone with an admiration for top-quality design from Germany and other quality further afield should make a beeline for this store.” says a reviewer on-line. 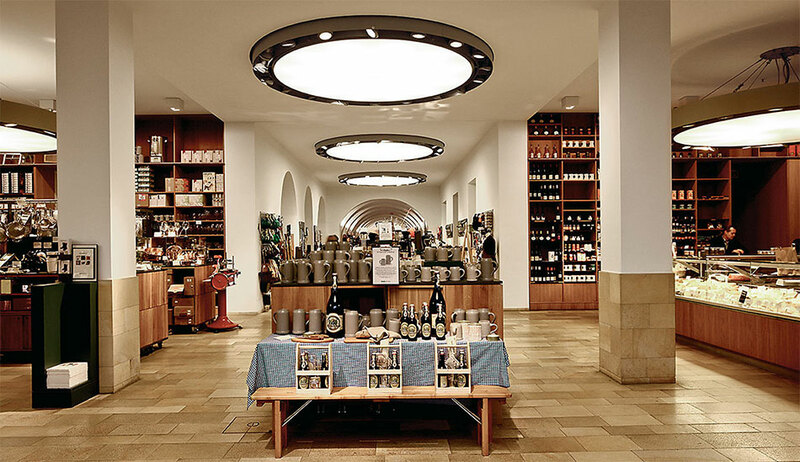 In addition to the nine full-sized stores in Germany, (the biggest is in the heart of Munich), they have an online store, www.manufactum.com, which serves primarily Germany, Austria, Switzerland and the UK. 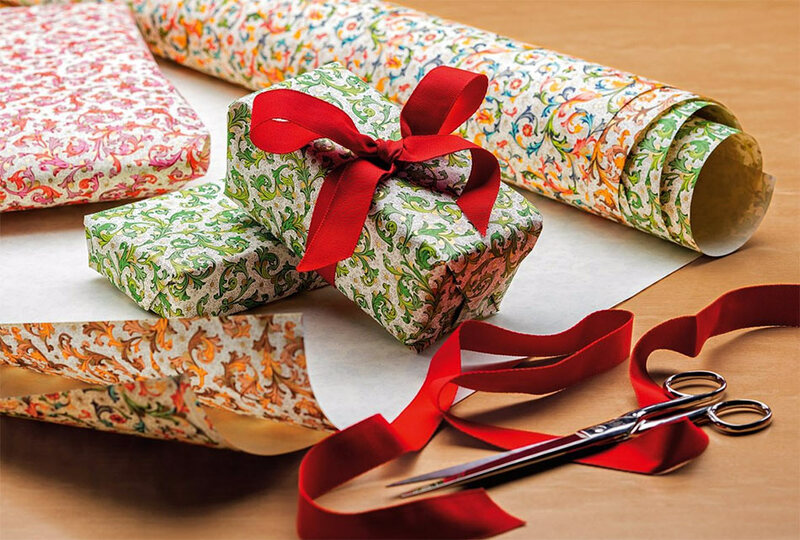 The products they offer are manufactured according to traditional artisan methods; the store’s website makes it clear: they carry only top of the line products that one may hope to last a lifetime. You may pay more for their wares, but it will be worth it. Just peruse their web site to see a glimmer of the wide selections they carry. The fact that they can also stock this number of selections and diverse products under one roof is mind boggling. Rossi is proud to be part of the quality products sold by Manufactum. 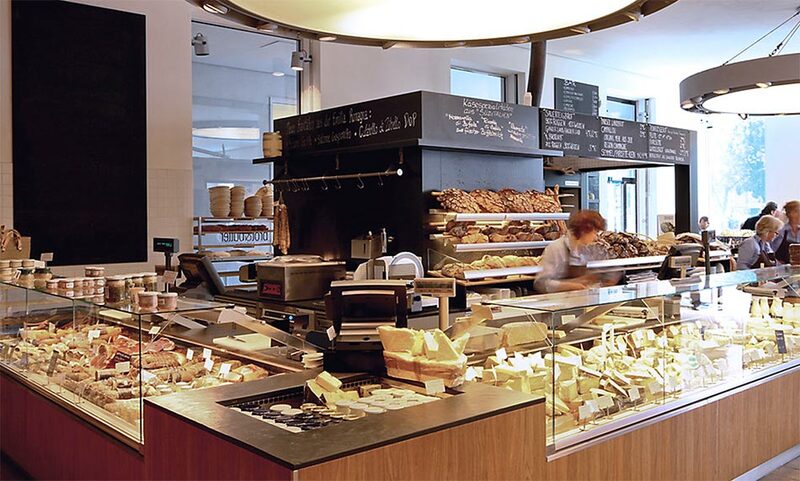 A huge part of Manufactum’s draw are these bakeries, like this one in Munich. 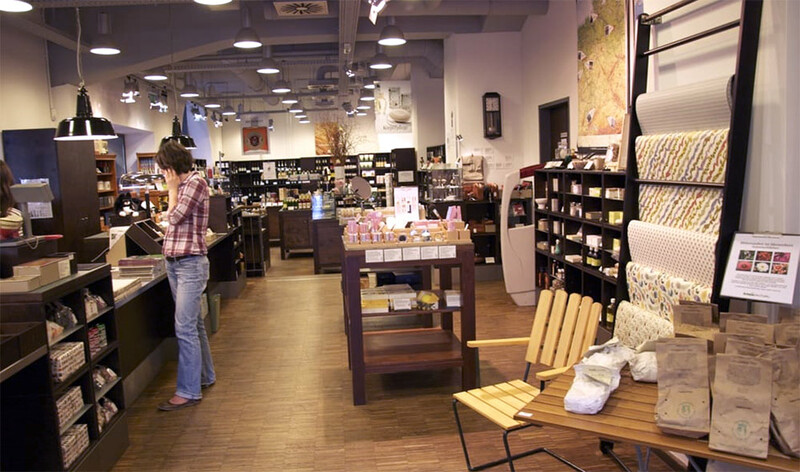 In 8 of the nine stores, there is a food emporium within each store called Brot & Butter. It is a very big attraction. Usually near the entrance of the store, the café emits smells of baking loaves and pungent cheeses, luring in customers from the streets to Manufactum. Often the bakery and food shop is the destination. All items are baked and produced in- house; items such as sour dough bread, walnut campaillou or yeast knots are freshly baked every day. There are many carefully selected foods, for example, hand-crafted cheese and sausage from local farms. One customer was quoted as saying “Manufactum, “the good things in life still exist”.